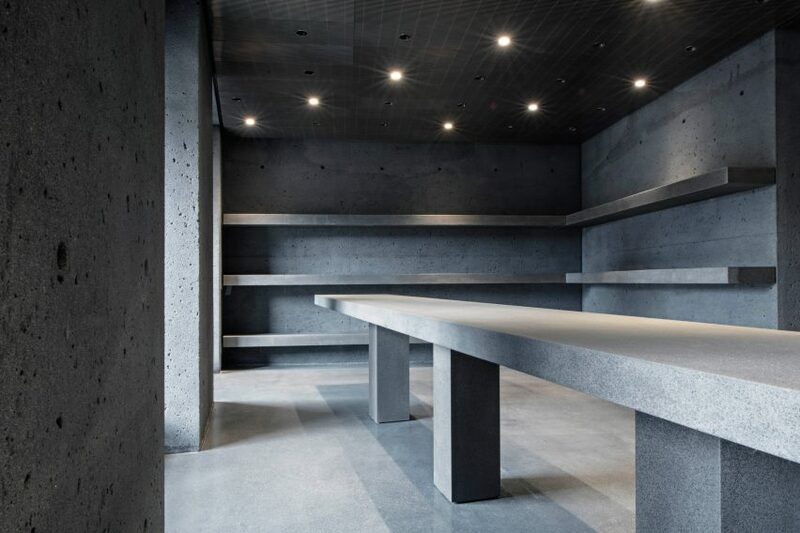 British firm David Chipperfield Architects has completed its first project in Canada – the overhaul of a 19th-century building into a minimalist fashion store. 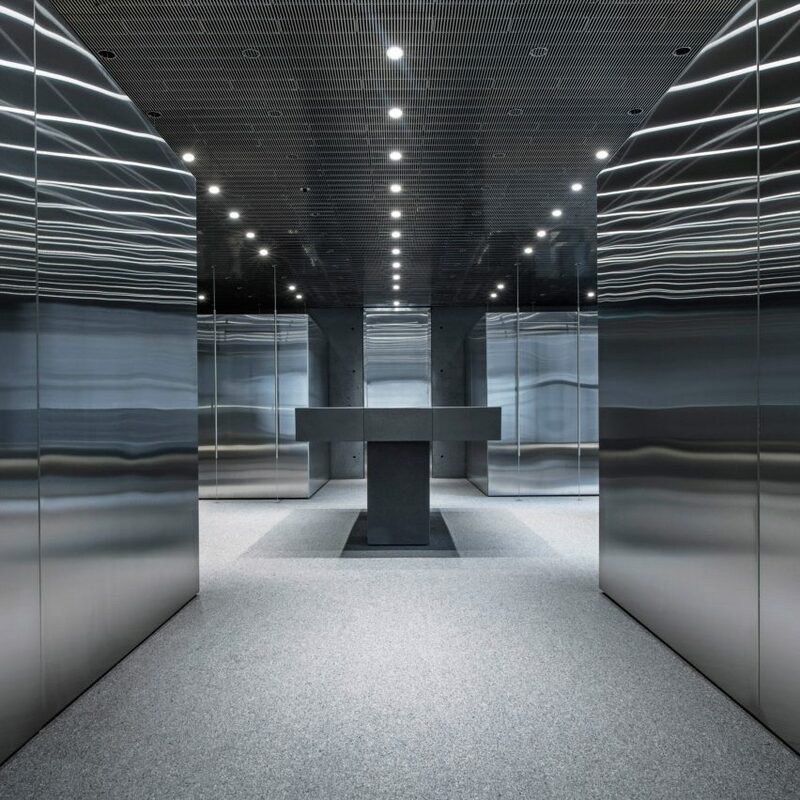 The store for Ssense, an e-commerce label that has expanded to its first brick-and-mortar shop in Montreal, spans 13,000 square feet (1,208 square metres) across five storeys. 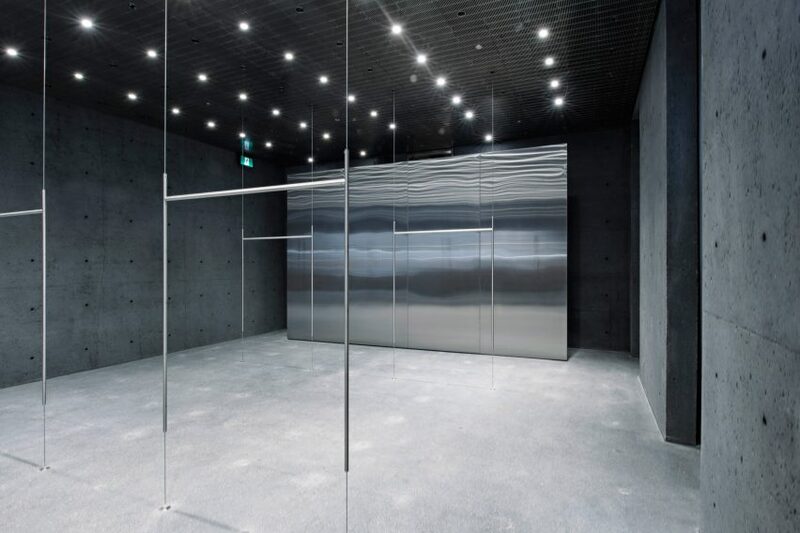 Chipperfield’s firm renovated the interiors of the historic building near the city’s Old Port with a greyscale palette of raw concrete, and mirrored and metallic surfaces. In order to preserve the bones of the structure, a concrete shell was inserted behind the timber facade, allowing contemporary and minimalist interiors contrast with the more decorative exterior. “The space houses an in-situ concrete structure — a building-within-a-building — where the concrete architecture is transparently expressed and explicitly exposed while preserving the original historic facade,” said a statement from the architecture firm. Along with spaces for displaying clothing and accessories, the building houses a glass-roofed cafe that is decorated with concrete benches and tables, and is equipped to fit 34 people. Two floors are dedicated to fitting rooms and personal shopping appointments. The store provides a physical counterpart to the online brand, so technology in the space was a priority. Within 24 hours of scheduling an appointment online, products can be delivered and tried on by the customers at the store. Built inside is a vertical lift module (VLM) for delivering and storing orders, which is traditionally used in warehouses. Wiring is hidden away in the walls, floors and ceilings to keep the surfaces as bare as possible. “A 60-centimetre grid system is embedded throughout the unforgiving concrete structure, determining the formwork and placement of a hidden convertible socket system for all mechanical, functional, and technical elements,” said a statement. A live performance artwork and a public installation in the store was designed in collaboration with luxury Italian label Prada, and directed by Arca and Carlos Sáez. The accompanies an exclusive four-piece Prada capsule collection, available from Ssense both in-store and online. Ssense stocks women’s, men’s and kids apparel from a selection of high-end fashion labels. The company is also based in Montreal, at offices designed by Canadian studio Atelier Barda that were completed last year and have a similar minimal aesthetic to the new store. David Chipperfield Architects is no stranger to retail, having designed stores for fashion brands like Valentino and Bally. Photography is courtesy of Ssense. Orange City is the Best Blog & Magazine for Cities and Architecture with tons of information and projects to learn from. @2018 - Orange City. All Right Reserved.